The Dallas Cowboys continuing to churn their offseason roster is not inherently newsworthy. Throw in just one name and this instantly changes. Enter Running Back Darius Jackson. The Cowboys sixth round pick in 2016 has yet to take a hand off in a regular season game, but remains a fan-favorite prospect. According to Todd Archer, Jackson is working out for a chance at a second stint with the Cowboys. The Cowboys have released LB Ed Shockley and WR Maliek Earl and are working out a number of players, including RB Darius Jackson, who was a sixth round pick of theirs in 2016. The Cowboys offense lacks any form of certainty at the skill positions. Of course, their first round pick from the same draft that brought the Cowboys Darius Jackson is going to be featured prominently behind a reloaded offensive line. 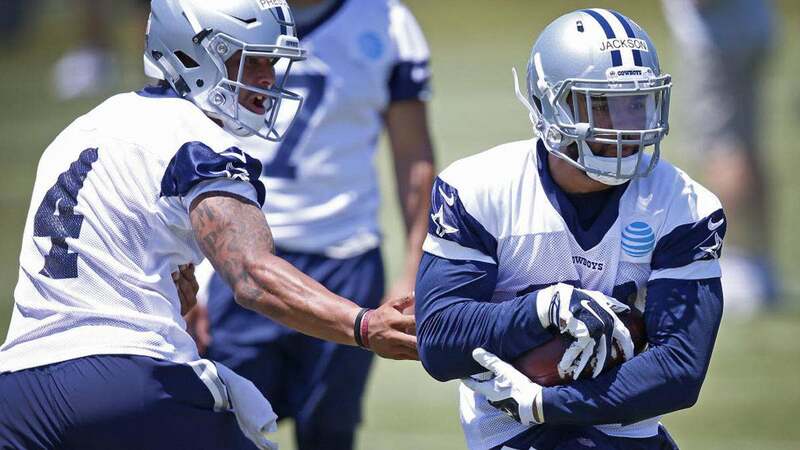 Fighting for snaps behind Elliott is Rod Smith, Tavon Austin, and perhaps now Jackson. The theme behind this backfield stable is versatility and athleticism, which can also be found at WR for the Cowboys - a position Austin can still be featured at. In other roster move notes, the Cowboys have released Wide Receiver Malik Earl, who visited with the team before the draft and signed as a UDFA, along with Linebacker Ed Shockley. A pure running back with pass catching ability and an easy second gear, adding another player like Darius Jackson makes sense for the Cowboys. Actually signing Jackson would still be surprising, as roster spots are hard to come by in Dallas - as are snaps for running backs not named Ezekiel Elliott. Since his release in 2016, which the Cowboys used to activate Darren McFadden, Jackson has done nothing to show that he deserves a role in any NFL offense. Particularly that of Scott Linehan's, with the Cowboys offensive coordinator already having big plans for third-year Quarterback Dak Prescott to evolve given the talent already around him. It shouldn't take long to find out if Darius Jackson fits into this plan for the Cowboys. Tell us what you think about "Cowboys Working Out Former RB Darius Jackson, Release LB and WR" in the comments below. You can also email me at Sean.Martin@InsideTheStar.com, or Tweet to me at @SeanMartinNFL! With DT David Irving Getting “Into Shape,” Do Cowboys Have Better Options?